January 25, 2019- In his first primetime Oval Office address, President Donald Trump called on Congress to address what he called a “growing humanitarian and security crisis” at the United States’ southern border, spawned in part by the recent arrival of a caravan of 6,500 migrants from Central America’s Northern Triangle region. In her paper, titled “Immigration and National Security: An Empirical Assessment of Central American Immigration and Violent Crime in the United States,” Daphne Blanchard examines the extent of the potential threat by gathering quantitative data of previous Central American migration flows and the impact they have had on violence in American communities. The author contends that as rhetoric from high-level politicians and news media makes connections between violent crime and immigration, political parties’ stances on immigration become more divergent — leading to the inability to agree on comprehensive immigration reform. Not only does this research add to the understanding of the potential threat of these particular migrants to U.S. communities, its findings can be generalized to the overall public debate of the nature of immigration and national security. Ms. Blanchard found that Central American migration has been hyperinflated in scope and potential for insecurity. Migrants from the Northern Triangle of Central America (NTCA) region, formed by El Salvador, Guatemala, and Honduras, have indeed surged over the past two decades–their numbers more than double the estimated 1.5 million people from that region in 2000–and the number of unaccompanied minors and families crossing the US-Mexico border has dramatically increased since 2008. 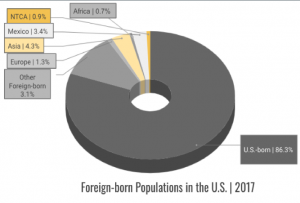 However, the author argues the importance of putting their numbers in perspective, noting that this subset of immigrants constitutes less than one percent of the share of the overall U.S. population. The evidence compiled by Ms. Blanchard suggests that the surge in migration from the Northern Triangle to the United States has not been accompanied by increases in violent crime that would warrant sounding the national security threat alarm. Not only did overall U.S. violent crime rates descend as Central American migration share rose; but the influx of these foreigners in 27 metro areas showed no correlation when compared to the violent crime rate changes during 2012 to 2017. 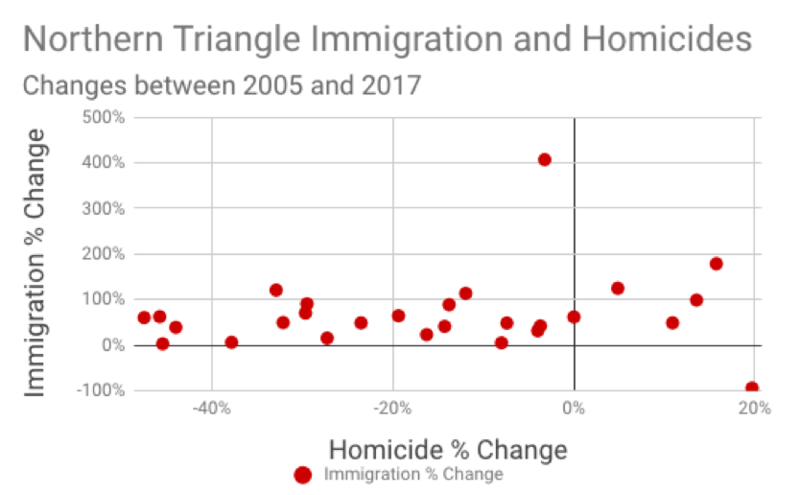 When compared to homicide rate changes, the weak correlation is even more evident; and in the vast majority of cases, homicide rates declined as immigration climbed significantly. It is interesting to note that the only metro area to experience a reduction in Northern Triangle concentration was Columbus, Ohio, which also experienced a 20 percent rise in homicide rates. Not one of the 27 metros with high concentration of immigrants from the NTCA region is within the top ten of the most violent metros in the United States. The brutal gang of El Salvadoran origins, Mara Salvatrucha (MS-13), and claims of it infiltrating American communities, has received high level attention in social and news media. Ms. Blanchard compiled data to understand the scope and reach of this transnational gang to ascertain its potential ability to disrupt the stability and security of the nation. In her study, Ms. Blanchard found that according to the U.S. Federal Bureau of Investigation (FBI), approximately ten thousand MS-13 members inhabit the United States, amounting to 0.3 percent of the overall U.S. population. By comparison, there are approximately 1.4 million gang members living in the United States that make up more than 33,000 gangs. The Cato Institute reports that 0.1 percent of U.S. Customs and Border Patrol arrests at the border mid-year in 2018 were MS-13 gang members, similar to the statistics from prior years. Of the 1.2 million violent crime offenses committed in the United States between 2012 and 2017, 345 were committed by members of the MS-13 gang. Therefore, the author contends that although a legitimate concern for the communities which it inhabits, this criminal organization does not have the potential to disrupt the security of the United States as a whole. She suggests that the violence of this subgroup of a subgroup should be addressed at a local level and separated from the immigration dialogue. Ms. Blanchard contends that the conflating of all immigrants with the MS-13 gang, as has been done repeatedly through President Trump’s tweets and speeches, is unfounded and problematic. The author offers several policy recommendations to address the surge in Central American migration, to reduce the burden on host countries, and to facilitate balanced immigration dialogue. First, the author suggests engaging media, community, and non-governmental organizations in an effort to balance the dialogue surrounding the migrants and inform the American public of the extent of the threat, thus encouraging fact-based immigration policy-making and aiding in the migrants’ assimilation. The author also urges these groups to highlight the positive results occurring in the Northern Triangle region to audiences in both in the NTCA and the United States. She contends that the hopelessness that drives migrants from their homes could be replaced with increased confidence in local governance and civic action to support the ongoing efforts towards stability and economic opportunities. Ms. Blanchard calls on the United States government to offer sustained and increasing support to sending communities to reduce the push factors of migration. In addition, Ms. Blanchard urges the United States to support other host countries to create additional safe havens in the region through the offsetting of the onboarding costs and engaging in cooperative security initiatives. She points out that if Mexico is unable to shoulder the burden of absorbing the new arrivals or if the migrants are unable to find safe haven in Mexico, the United States is obligated by international law to hear their asylum claims on U.S. soil. Another recommendation the author offers is to give priority to bilateral workforce development initiatives that have the potential to reduce the need to migrate northward. Finally, Ms. Blanchard suggests that the United States reevaluates the traditional resettlement-based international refugee policy and consider a development-based one, which can transform refugees from a burden to a benefit for the host country. Times, The New York. 2019. “Full Transcripts: Trump’s Speech on Immigration and the Democratic Response.” The New York Times, January 9, 2019, sec. U.S. https://www.nytimes.com/2019/01/08/us/politics/trump-speech-transcript.html. Lesser, G, and J Batalova. “Central American Immigrants in the United States.” Migration Policy Institute, April 5, 2017. Cara Labrador, R., and D. Renwick. “Central America’s Violent Northern Triangle.” Council on Foreign Relations, June 26, 2018, Backgrounder edition. https://www.cfr.org/backgrounder/central-americas-violent-northern-triangle. “2011 National Gang Threat Assessment.” U.S. Federal Bureau of Investigation. Accessed November 16, 2018. https://www.fbi.gov/stats-services/publications/2011-national-gang-threat-assessment. Bier, David. 2018. “0.1% of Border Patrol Arrests Are MS-13.” https://www.cato.org/blog/01-border-patrol-arrests-are-ms-13. Vaughan. n.d. “MS-13 Resurgence: Immigration Enforcement Needed to Take Back Our Streets.” Center for Immigration Studies. Accessed October 26, 2018. https://cis.org/Report/MS13-Resurgence-Immigration-Enforcement-Needed-Take-Back-Our-Streets. Mexico’s Supreme Court of Justice of the Nation. Source: Wikipedia. 12/30/18 (written by kheinle) — Mexico’s Supreme Court (Suprema Corte de Justicia Nacional, SCJN) made a significant decision in November regarding the proposed Law on Internal Security (Ley de Seguridad Interior). The law was meant to address Mexico’s notoriously high levels of crime and violence. It sought to expand safety on the domestic front, minimize threats towards internal security, and increase the role of the military in domestic affairs. The latter includes the military’s capacity to gather intelligence and evidence in proposed crimes. On November 15, 2018, however, the Supreme Court ruled the law unconstitutional, arguing that it went against both the Mexican Constitution and international treaties to which Mexico is a signatory. The Court also said that Mexico’s Congress, which had approved the law, should not legislate on matters of internal security. 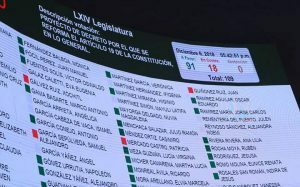 When the draft law was published in December 2017, Congress was controlled by the Institutional Revolutionary Party (Partido Revolucionario Institucional, PRI), the party of then-President Enrique Peña Nieto (2012-2018). On December 1, 2018, the new government took over under now-President Andrés Manuel López Obrador (AMLO) of the National Regeneration Movement (Movimiento Regeneración Nacional, MORENA) took office. 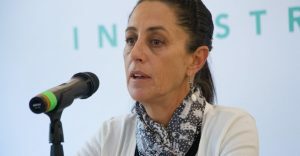 The high court’s decision is one that Esmeralda Arosema de Troitiño, the spokesperson for Mexico’s Interamerican Commission on Human Rights (Comisión Interamericana de Derechos Humanos, CIDH), argued set a precedent for President López Obrador’s incoming government. The Court’s decision “constitutes an indispensable judicial precedent as the base for the new government to present a concrete plan to gradually draw down military in public security matters…,” she said. The developments with the Law on Internal Security paralleled President López Obrador’s ongoing push for a National Guard, which has also raised concerns about human rights and public safety. Cámara de Deputados del H. Congreso de la Unión. 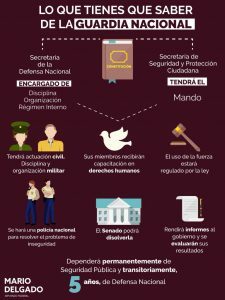 “Ley de Seguridad Interior.” Diario Oficial de la Federación. December 21, 2017. PDF. Suarez-Enriquez, Ximena and Maureen Meyer. “Multiple Sectors Push Back Against the Implementation of Mexico’s New Internal Security Law.” WOLA. January 25, 2018. Joint Statement. “International Observatory on Mexico: The Decision of Mexico’s Supreme Court on the Internal Security Law Will Set a Fundamental Precedent on Militarization in the Country and in the Region.” Washington Office on Latin America. November 2, 2018. Ferri, Pablo. “La justicia mexicana tumba la ley del gobierno saliente que perpetúa el papel policial del Ejército.” El País. November 16, 2018. Roldán, Mariluz. “CIDH celebra invalidación de Ley de Seguridad Interior.” El Universal. November 26, 2018. “Critics voice concerns over Mexico’s proposed National Guard.” Justice in Mexico. December 24, 2018. 12/10/18 (written by Kimberly Heinle) — The Mexican Senate approved reforms to Article 19 of the Mexican Constitution on December 6 that expands the crimes for which one can be held without bail. Individuals accused of misusing public funds for electoral means, sexually abusing minors, and forcibly disappearing persons, among others, may now be held without bail. The reform passed the Senate with 91 votes in favor and 18 against. National Commission of Human Rights (CNDH) President Luís Raúl González Pérez. Source: La Jornada. 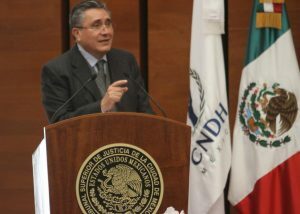 Luís Raúl González Pérez, president of Mexico’s National Commission of Human Rights (Comisión Nacional de Derechos Humanos, CNDH), also criticized the reform. He called it a “regressive” initiative, arguing that Congress should have prioritized the training and professionalization of the justice system operators first. Otherwise, he added, any charge brought forth opens the door to the suspect being held indefinitely due to the inefficiencies of the system’s operators to provide swift justice. 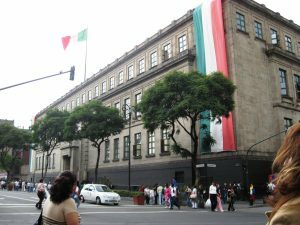 Mexico’s court system has long been criticized for the lengthy times that the accused have been detained while their case is processed. The New York Times, for example, recently highlighted one individual who has been held without sentencing for over 16 years. One element of the Accusatorial Criminal Justice System (Sistema de Justicia Penal Acusatorio, SJPA) that seeks to mitigate situations like that is the limit it places on the amount of time a suspect can be detained before trial. This appears to now be at odds with the Senate’s recent approval. Congress will evaluate the reform’s success and effectiveness in five years. Villegas, Paulina. “La justicia en México: dieciséis años en prisión, preventiva sin sentencia.” The New York Times. November 13, 2018. Olivares Alonso, Emir. “Regresiva’, reforma para ampliar prisión preventiva: CNDH.” La Jornada. December 4, 2018. Ballinas, Víctor y Andrea Becerri. “Ampliar en el país la prisión preventativa, peligroso: ONU.” La Jornada. December 5, 2018. “Nestora Salgado, la única senadora de Morena que votó contra reforma de prisión preventiva.” SDP Noticias. December 6, 2018. 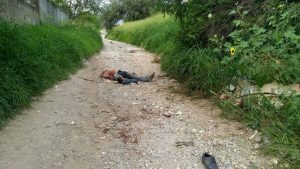 8/20/2018 (written by Quinn Skerlos)- Earlier this summer, on May 29th, the body of Hector Gonzalez Antonio was found on a dirt road in Ciudad Victoria, Tamaulipas. According to authorities, Gonzalez Antonio’s corpse showed signs of being beaten, likely with rocks. The journalist, worked for Grupo Imagen’s TV and newspaper services, and covered a crime beat. On June 30th, Mexican journalist, Jose Guadalupe Chan Dzib was murdered in Quintana Roo, one of Mexico’s historically least violent states. Even more recently, journalist and founder of Playa News, Ruben Pat was murdered on July 24th also in Quintana Roo, bringing the journalist death toll for 2018 to at least 7. He had previously reported being threatened by local police. A relevant report on violence against journalists by the Congressional Research Service highlights the occupational hazards that Mexican journalists like Gonzalez Antonio, Chan Dzib, and Pat experience and the counter-measures implemented to protect their line of work. On May 27, 2018, the Congressional Research Service (CRS, Library of Congress), a non-partisan research firm that provides policy analysis for the U.S. House and Senate, published a report on press freedom, or lack thereof, in Mexico. The author, Clare Ribando Seelke, is a Latin America specialist and well-published author, particularly on topics of human trafficking in Latin America. 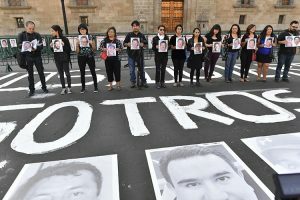 This recent report, titled “Violence Against Journalists in Mexico: in Brief” investigates the following; the status of press freedom in Mexico, violent crimes against journalists, Mexico’s efforts to address said violence, and finally, the role of the U.S. government in encouraging Mexican rule of law. The report leads off with a comparison of press freedom within Latin America, and a summary of crimes against journalists. Although press freedom has continued to decline across Latin America, the report argues that Mexico remains one of the most dangerous places in the world to be a journalist. The report highlights statistics from both Justice in Mexico and the Committee to Protect Journalists to show the hazards faced by journalists (CPJ). For example, in the last decade, Justice in Mexico reports that 140 journalists and media professionals were killed in Mexico. On that note, the report identifies that Mexico sports one of the highest murder rates for journalists in the world and is in the top 10 deadliest countries worldwide for media workers. In 2017 alone, Article 19, an international human rights organization, found that there were 500 “aggressions,” or violent actions against journalists not limited to just kidnapping and murder (Article 19). This number is significantly higher than the year before and Mexican journalists continue to face economic and psychological pressures, leading some to seek asylum abroad. The report then delves into some of the efforts taken by Mexican officials to counter and reduce violence against journalists. According to the CRS report, the Federal Protection Mechanism, established by the Mexican government in 2012, has provided protection for 380 journalists by means of armed guards, panic buttons, and other resources. Another governmental initiative, the Special Unit for Crimes Against Journalists and Violations of Freedom of Expression (Fiscalía Especial para la Atención de Delitos Cometidos contra la Libertad de Expresión, or FEADLE) was established as its own office under the Attorney General in 2010. FEADLE has the authority to investigate any case, even if it is already under review by state authorities. However, the CRS report also underlines the shortcomings of governmental protections in Mexico. For example, the U.N. and other human rights authorities maintained that the Federal Protection mechanism is “surprisingly limited,” as studies have shown that some panic buttons lacked functionality and were structurally ineffective (OHCHR). These buttons reach only local police, who potentially lack the resources or the will to help, or are in the pocket of organized crime (OHCHR). Only 12.6 percent of cases investigated by FEADLE ended in convictions against perpetrators from 2010 until 2017, leading the Inter-American Commission for Human Rights to state that FEADLE “still has not made any impact in combatting impunity (OHCHR).” The CRS highlighted a CPJ report that claims an 86% impunity rate for journalists killed as a result of their work (CPJ). In its conclusion, the report underscores the U.S. State Department-sponsored Merida Initiative that has given 2.9 billion dollars in support of rule of law in Mexico. However, as the report points out, U.S. congressional officials have discussed concerns about human rights conditions in Mexico, including the Mexican government’s ineffective protection of journalists and human rights advocates. Governmental organizations receiving U.S. aid continue to be monitored, and in 2014 and 2016 Mexico was refused certain assets because they had not made sufficient progress on human rights issues. While there have been policy obstacles for the partnership, the partnership remains, with aid specifically directed towards strengthening rule of law, protecting human rights, and reducing impunity rates. According to Justice in Mexico’s “2018 Drug Violence Report,” 133 Mexican journalists have been killed from 2006 to 2016. The report highlights that journalists in Mexico are three times more likely to be killed than the general public. Last year alone, 14 media workers were killed, including the prominent corruption and organized crime reporters Miroslava Breach and Javier Valdez. La Jornada, one of Mexico City’s daily newspapers, reported that Mexican journalists do not feel confident in government institutions to protect them, and that more than 60% of journalists surveyed have reported aggressions pointed towards them regardless of public protections (La Jornada). Even with government measures, such as FEADLE and the federal protection mechanism, Reporters Without Borders listed Mexico as 147th in world press freedom for 2018, a worse ranking than South Sudan and Afghanistan (RSF). In a statement made by the CPJ, impunity “has made the country one of the most dangerous places in the world for reporters” and the 2000 acts of violence against journalists in Mexico recorded by the CPJ since 2012 seem to echo this sentiment (CPJ). Journalism across Mexico is being affected by violence and impunity, and while the government appears to have taken steps to help, there is room for improvement in order to fully protect press freedom and journalists in Mexico. “Libertades en Resistencia: Informe 2016 de Article 19.” Articulo 19. April 2017. https://articulo19.org/informe2016/.